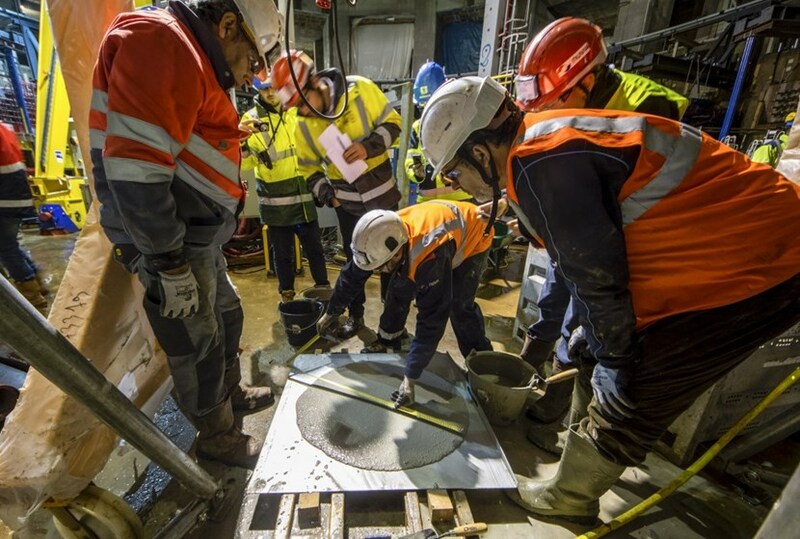 Like ancient priests bent over the entrails of a sacrificial bull, a group of men in hard hats are carefully examining a bucketful of semiliquid concrete as it slowly expands on a perfectly flat steel slab. A strategic operation, one for which no chance can be taken, is set to begin—the pouring of the tokamak "crown," the massive structure that will support the combined mass of the Tokamak and its encasing cryostat (23,000 tonnes) while transferring the forces and stresses generated during plasma operation to the ground. The "slump test" will determine if pouring operations can begin. Up until that moment, the pumps had been fed with slurry, which acts as a lubricant for the interior surfaces of the pipes. Now, operators need to make sure that the concrete coming out of the pumps is slurry-free and consistent with the required formulation. On the steel slab, the concrete sample has stopped expanding—it is now perfectly circular and looks like an oversized grey pancake. This is the moment of truth: if the circle's diameter corresponds to a pre-established number, the concrete that comes out of the pumps matches the expected fluidity; if the diameter is larger, it means that slurry is still present and must be evacuated. Slump tests are systematically performed when the concrete-mixing trucks leave the batching plant to deliver their load to the pumps. When using special-formulation, self-compacting concrete—like in the crown's case—slumps tests are performed again on the very site of the pouring, minutes before actual operations begin. In the basement level of the bioshield, the ancient priests in hard hats are at last satisfied with what they see: the circle is perfect, its diameter precisely matching the right figure. Operations can begin—another long night of pouring for one of the most important structures of the whole Tokamak Complex.